Rescue Cream is a non greasy intensive moisturiser designed to re-hydrate dry. rough, sensitive skin. With regular use it helps protect the skin against environmental influences and other external stress factors. As a well known indicator of how the body feels inside, our skin is often the first place to show the effects of a demanding life. This can lead to dry, rough, flaky skin. 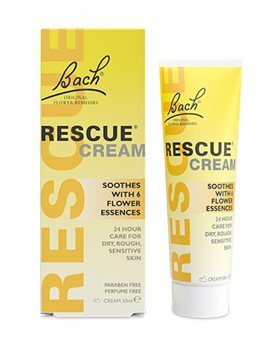 Rescue Cream combines 5 flower essences along with Dr.Bach's cleansing essence of Crab Apple with intensive moisturisers to help re-hydrate and care for dry, sensitive skin. Non greasy formula suitable for hands, body & face. Safe to use on rough, flaking or chapped skin. Quickly absorbed to leave skin soft, smooth and re-hydrated. Aqua, Glyceryl stearate PEG - 100 stearate, Prunus armeniaca kernel oil, Theobroma cacao butter, Glycerin, cetearyl Alcohol, Cetyl palmitate, Caprylyl glycol, Phenoxyethanol, Glyceryl caprylate, Benzyl alcohol, Helianthemum nummularium, Clematis vitalba, Impatiens glandulifera, Prunus cerasifera, Ornithogalum umbellatum, Malus pumila. Apply a generous amount of Rescue Cream to the desired area. Check that seal is intact before use. To open, pierce tube seal with the point located on the top of the cap. I came upon this cream purely by accident. I've used other Bach Remedies and found them to be great. This cream was "reduced for quick sale" at a local pharmacy so I thought "why not give it a try" and it has proved to be an essential part of my "potions" - I've used it for healing cuts, soothing sore hands, used it on my dogs to heal cuts too and "bonus", it's not poisonous for them unlike some other healing creams. Then when I went to buy more I could not find in Aust so was happy to order from UK. I have used this product for years but sadly it is no longer available in Australia so I source it from HealthStuff in the UK. It is truly my saviour, my most recent use of this product was for restoring my very dry, flaky, discoloured nails to their former 'glory' after a very bad experience with Shellac!!! I wouldn't be without a tube of this in my workplace, my handbag and my bathroom. I can't live without this cream for my extreme sensitive skin. It is very difficult to find here and very expensive. And IF I can get it here, I can't get the larger 50g size. So I get it from Health Stuff at a great price, fair and super fast postage. Thank You!